Good news for iPhone, iPod touch and iPad users. 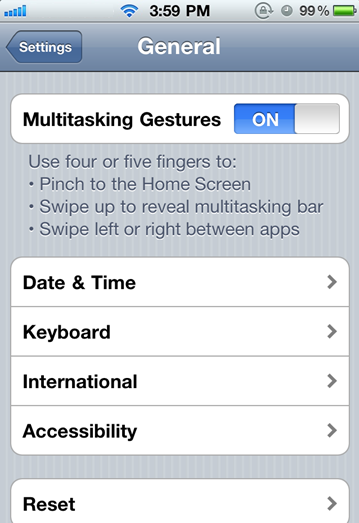 Now you can enable multitouch gestures on your iPhone, iPod touch and iPad running iOS 4.3.1. A new jailbreak tweak has been released in Cydia which will allow you to enable multitouch gestures on your iPhone, iPod touch and iPad running iOS 4.3.1. The name of this tweak is MT Gestures. After installing this tweak on your jailbroken iPhone, iPod touch and iPad you can enable it in winterboard. You should note that this tweak will not add any new icon on the springboard of your iPhone. A new toggle will appear in the Settings.app of your iOS device. Simply go to Settings.app to configure this tweak. 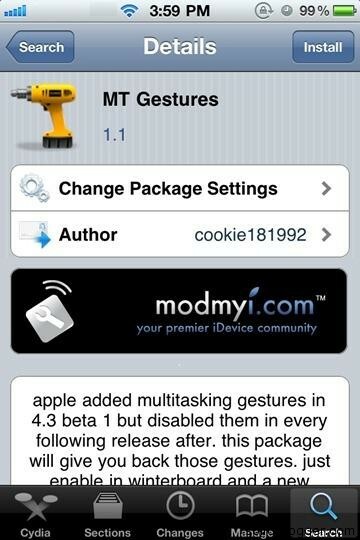 MT Gestures is available in Cydia under ModMyi repository. You will need to have jailbroken iPhone, iPod touch and iPad to install this tweak. Simply follow the steps posted here to jailbreak your iPhone, iPod touch and iPad on iOS 4.3.1 using Redsn0w 0.9.6 RC9 or you can follow the steps posted here to jailbreak your iPhone, iPod touch and iPad on iOS 4.3.1 using Sn0wbreeze v2.5.